Nearest weather station, with distance and direction from RNA: The nearest weather station is at the Bienville District Ranger's office at Forest, MS, approximately 16 miles (26.3 km) northwest of the RNA. Maximum and minimum temperatures: The climate of the Nutmeg Hickory RNA is characterized by mild winters and hot summers. The mean maximum in August is 91°F and the mean maximum in January is 54°F. Elevation: The elevation of the area ranges from 340 to 370 feet (104-113 m). Geology and Soils: The RNA is underlain by the Jackson Group of Eocene Age. The Jackson group in this area is composed of the Yazoo formation and the Moodys Branch formation. The soils in this area are in the Urbo and Louin soil series. Aquatic Features: The RNA is a relatively undisturbed wetland ecosystem. It is located in the Quarterliah Creek drainage. Plant Communities: The Nutmeg Hickory RNA is a wetland forest with an unusual association of tree species. The area has a mixed age and species component of bottomland hardwoods and a scattering of spruce pine (Pinus glabra). 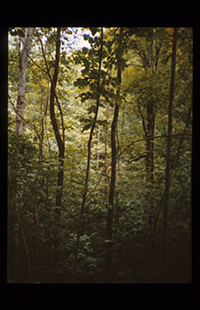 Canopy species present on the RNA include the uncommon nutmeg hickory (Carya myristiciformis), Durand’s oak (Quercus durandii), shagbark hickory (C. ovata), and diamond-leaf oak (Q. laurifolia). At Risk Species: The RNA provides habitat for a sensitive orchid species, the purple fringeless orchid, Platanthera peramoena. Common Shrub Species: Shrub species on the RNA include Baccaris halmifolia, Ilex decidua, Sambucus canadensis, Myrica cerifera and Vaccinium elliottii. Common Herbaceous Species: Common herbaceous species include: Rhus toxicodendron, Campsis radicans, Carex spp., Boehmeria cylindrica, Aster spp., Ludwigia spp., Panicum spp., Smilax spp., and Vitis spp.